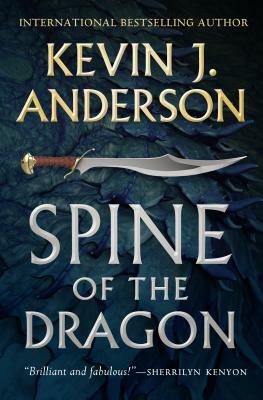 New York Times bestselling author Kevin J. Anderson triumphantly returns to epic fantasy with the Wake the Dragon series. Spine of the Dragon is a politically charged adventure of swords, sorcery, venegeance, and the rise of sleeping giants. Two continents at war, the Three Kingdoms and Ishara, are divided by past bloodshed. When an outside threat arises—the reawakening of a powerful ancient race that wants to remake the world—the two warring nations must somehow set aside generational hatreds and form an alliance to fight their true enemy. More than two dozen of Kevin J. Anderson's novels have appeared on national bestseller lists; and he has over eleven million books in print worldwide. His works have been translated into over 22 languages including German, Japanese, Spanish, Chinese, Korean and Hebrew. For a book signing during the promotional tour for his comedy/adventure novel AI! PEDRITO!, Anderson broke the Guinness World Record for "Largest Single-Author Signing," passing the previous records set by Gen. Colin Powell and Howard Stern. Kevin worked in California for twelve years as a technical writer and editor at the Lawrence Livermore National Laboratory, one of the nation's largest research facilities. At the Livermore Lab, he met his wife Rebecca Moesta and also his frequent co-author, Doug Beason. After he had published ten of his own science fiction novels to wide critical acclaim, he came to the attention of Lucasfilm, and was offered the chance to write Star Wars novels. The novels in his Star Wars Jedi Academy trilogy became the three top-selling science fiction novels of 1994. He has also completed numerous other projects for Lucasfilm, including the 14 volumes in The New York Times bestselling Young Jedi Knights series (co-written with his wife Rebecca Moesta). His three original Star Wars anthologies are the bestselling SF anthologies of all time. Kevin is also the author of three hardcover novels based on the X-Files; all three became international bestsellers, the first of which reached #1 on the London Sunday Times bestseller list. Ground Zero was voted "Best Science Fiction Novel of 1995" by the readers of SFX magazine. Ruins hit The New York Times bestseller list, the first X-Files novel ever to do so, and was voted "Best Science Fiction Novel of 1996." Kevin's thriller Ignition, written with Doug Beason, has sold to Universal Studios as a major motion picture. Anderson and Beason's novels have been nominated for the Nebula Award and the American Physics Society's "Forum" award. Their other novels include Virtual Destruction, Fallout, and Ill Wind, which has been optioned by ABC TV for a television movie or miniseries. His collaborative works include ARTIFACT (Forge Books; May 2003), a thriller written with F. Paul Wilson, Janet Berliner, and Mathew Costello; and DUNE: THE BATTLE OF CORRIN (Tor Books; August 2004) written with Brian Herbert, Book 3 of their acclaimed Legends of Dune trilogy, and the sequel to the bestsellers DUNE: THE BUTLERIAN JIHAD and DUNE: THE MACHINE CRUSADE. Kevin's solo work has garnered wide critical acclaim; for example, Climbing Olympus was voted the best paperback SF novel of 1995 by Locus Magazine, Resurrection, Inc., was nominated for the Bram Stoker Award, and his novel Blindfold was a 1996 preliminary Nebula nominee. Anderson has written numerous bestselling comics, including Star Wars and Predator titles for Dark Horse, and X-Files for Topps. Kevin's research has taken him to the top of Mount Whitney and the bottom of the Grand Canyon, inside the Cheyenne Mountain NORAD complex, into the Andes Mountains and the Amazon River, inside a Minuteman III missile silo and its underground control bunker, and onto the deck of the aircraft carrier Nimitz, inside NASA's Vehicle Assembly Building at Cape Canaveral. He's also been on the floor of the Pacific Stock Exchange, inside a plutonium plant at Los Alamos, behind the scenes at FBI Headquarters in Washington, DC, and out on an Atlas-E rocket launchpad. He also, occasionally, stays home and writes. Kevin and his wife, writer Rebecca Moesta, live in Colorado.